Hideo Tanaka (2015). The significance of just touching 'this feeling.' 26th International Focusing Conference, Seattle University, WA. 田中秀男 (2004/2005). ジェンドリンの初期体験過程理論に関する文献研究：心理療法研究におけるディルタイ哲学からの影響(上)・(下). 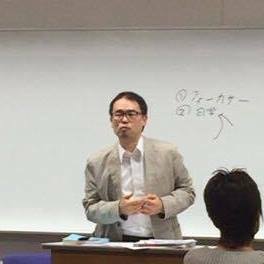 図書の譜：明治大学図書館紀要, 8, pp.56-81 & 9, pp.58-87. Tanaka, Hideo (2004/2005). A biblographic survey about E. T. Gendlin's early theory of experiencing: influences on his psychotherapeutic studies from W. Dilthey's philosophy, 1 & 2 [in Japanese]. Bulletin of Meiji University Library, 8, pp.56-81 & 9, pp.58-87. 田中秀男 (2014). そもそも「象徴化」とは？：「象徴化は必ずしも必要か」の議論の前に. 第1回TAE質的研究国際シンポジウム報告書（宮崎大学）, pp.98-103. Tanaka, Hideo (2014). What is 'symbolization? ': preliminary discussions on whether symbolizations are always necessary in psychotherapy [in Japanese]. The 1st TAE Qualitative Research Symposium Reports, pp.98-103. 田中秀男 (2015). ｢一致｣という用語にまつわる問題点とジェンドリンによる解決案. 人間性心理学研究, 33(1), pp.29-38. Tanaka, Hideo (2015). Some issues about the term 'congruence' and the solutions proposed by Gendlin [in Japanese]. The Japanese Journal of Humanistic Psychology, 33(1), pp.29-38. English abstract: It is generally said that Carl Rogers came to emphasize the “congruent” attitude of the therapist through the Wisconsin Project. On the other hand, Eugene Gendlin, despite being one of the most important theorists of the project, rarely uses the term “congruence” in his works. In this article, the author clarified how Gendlin saw the term “congruence” as a problem and how he resolved the problem, on the bases of his early primary work Experiencing and the Creation of Meaning. With this clarification, the author sets out to explore how to prevent misuses of the word “match” in Focusing. 田中秀男 (2016). ジェンドリンの心理療法研究における過程変数. 心理学叢誌（関西大学大学院心理学研究科）, 16, pp.105-111. Tanaka, Hideo (2016a). 'Process variables' in Gendlin's psychotherapy studies [in Japanese]. Kandai Psyclological Reports, 16, pp.105-111. 田中秀男・池見陽 (2016). フォーカシング創成期の2つの流れ：体験過程尺度とフォーカシング教示法の源流. サイコロジスト：関西大学臨床心理専門職大学院紀要, 6, pp.9-17. Tanaka, Hideo & Ikemi, Akira (2016). Two streams in the early period of focusing: the sources of the experiencing scales and focusing instructions [in Japanese]. Psychologist: Bulletin of the Graduate School of Professional Clinical Psychology, 6, pp.9-17. English abstract: It is generally cited on Focusing (Gendlin, 1981) that there are two kind of research studies conducted by Carl Rogers’ group which motivated Eugene Gendlin to advocate Focusing: '1. Success in therapy correlated not with what the clients talked about, but with how they talked.” “2. Success or failure in therapy could be predicted from the early interviews.' In fact, it has been found that these two kinds of research studies derived from different streams conducted by researchers who preceded Gendlin. The first kind of research studies above are the sources of the Experiencing scales, and the second kind of studies are the sources of Focusing instructions. In this article, the author attempts to show how Gendlin developed these two streams, merging them together to form what is now called “Focusing”. 田中秀男 (2017). 「一致」というテーマに関する最適の書 (特集 ロジャーズの中核三条件を読む). 人間性心理学研究, 34(2), pp.143-149. 本山智敬・坂中正義・三國牧子（編）(2015): ロジャーズの中核三条件：カウンセリングの本質を考える　第1巻　一致　創元社. Tanaka, Hideo (2017). The best book on the subject of 'congruence' (Special review article: discussions of the separate volumes Three Core Conditions Proposed by [Carl] Rogers) [in Japanese]. The Japanese Journal of Humanistic Psychology, 34(2), pp.143-149. 田中秀男 (2018). “この感じ”という直接参照：フォーカシングにおける短い沈黙をめぐって. 人間性心理学研究, 35(2), pp.209-219. Tanaka, Hideo (2018). Direct reference called 'this feeling': the significance of the short silence in focusing [in Japanese]. The Japanese Journal of Humanistic Psychology, 35(2), pp.209-219.